Over the years, Super Mario 64 modder Kaze Emanuar has done some incredibly impressive work as far as mods for the title goes. He’s remade Super Mario Odyssey’s mechanics in Super Mario 64, via the aptly named Super Mario Odyssey 64. He’s brought online multiplayer to the game via Super Mario 64 Online, complete with multiple playable characters and extra mods. And well, with Last Impact, he’s even gone and made a whole new Mario title on the same engine. He’s basically the one guy keeping the game alive at this point, and perhaps on par with Nintendo themselves in knowing the ins and outs of its engine. Yet even then, today’s mod is something to behold. Why? Because as the article title suggests, Kaze has now gone and remade the entirety of Super Mario Sunshine’s FLUDD mechanics in Super Mario 64! Here’s a video showing the mod in action. As you can see, it’s a pretty damn accurate remake. You’ve got all the nozzles from Sunshine, and they all work exactly as you’d expect them too. But hey, what would you expect from this guy? It’s like not it’s the first time he’s ever done something like this. Oh no, back when Last Impact was his main project, Kaze remade FLUDD as an ability there too. It wasn’t exactly a full recreation (given it only had the hover nozzle included) and it wasn’t used in many levels (only the second of fifteen), but it was neat enough none the less. Either way though, this new mod is a whole ‘nother story. After all, the Hover Nozzle, Spray Nozzle, Rocket Nozzle and Turbo Nozzle all in Super Mario 64? And working exactly as they did in Sunshine? That’s freaking awesome, and makes it wonder exactly how far the game’s engine can be taken before we somehow reach its limits. And it doesn’t stop there either. Oh no, these nozzles are not just a small add on released for laughs. They’re not like Super Mario 3D World 64 or Super Mario Odyssey 64, which existed purely for a technical showcase. Instead, they’re actually going to be used in a full demake of Super Mario Sunshine! No, we’re not joking. 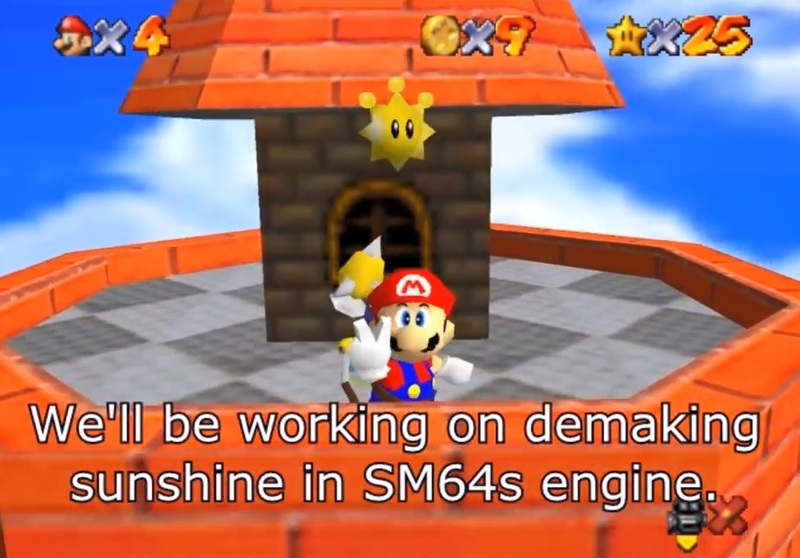 As mentioned in the video, he (along with the people at Team Cornersoft) are going to be remaking Super Mario Sunshine in Super Mario 64’s engine. It’s unknown how complete said mod will be but given the talk of levels being ported over and the work already been done on FLUDD, it seems likely it’ll be a project on the level of his Ocarina of Time remake. So yeah, let’s see how Super Mario Sunshine works out in Super Mario 64’s engine, and whether Mario’s tropical vacation can be brought over to the N64 in the process!